Building on the last blog, I want to offer you some tips on ways to improve, increase and expand your self-awareness. 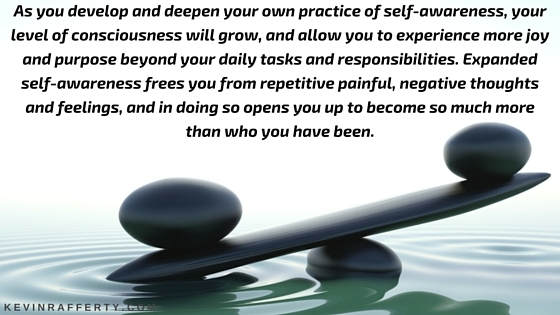 As you develop and deepen your own practice of self-awareness, your level of consciousness will grow, and allow you to experience more joy and purpose beyond your daily tasks and responsibilities. Expanded self-awareness frees you from repetitive painful, negative thoughts and feelings, and in doing so opens you up to become so much more than who you have been. The list below reflects what I have personally utilized to help me and my clients in some way achieve more meaningful and life-affirming levels of personal perception. While briefly noted here, each topic offers its own journey of exploration, reflection, healing realizations, releasing of old patterns, and allows space for new ways of thinking and being to take positive hold. In this blog I will expand on the first two. The others we will take up in future posts. extend the sessions by sitting longer in a conscious, calm state until you feel peaceful and fulfilled. The key is to take the peace and good feelings from your meditation into your daily life. Cultivate cheerfulness and optimism. Be emotionally stable. Meditate once or twice every day. Sit upright in a comfortable chair. It is all right to sit cross-legged if this is convenient. Hold the head up and direct your attention to the front and higher regions of the brain. Inhale and exhale once or twice to relax. Remain still for a few moments until you feel centered. Be aware of your natural breathing rhythm. When inhalation occurs naturally, some people choose to speak mentally a chosen word, such as God, peace, joy, or any pleasant word or mantra that resonates. When exhalation occurs, again mentally, speak the word. Feel that the sound of the chosen word is blossoming in your mind or your field of awareness. Do this without effort and without anxiety about results. When a state of conscious, calm awareness is experienced, discontinue listening to the word. Be still, letting the meditative calm persist for several minutes until you feel inclined to conclude the practice session. The Harvard Business Review recently published an article showing academic research citing the benefits of meditation, which are: builds resilience; increases emotional intelligence; enhances creativity, improves relationships; increases focus. All of these contribute to being a more effective, conscious leader. Other beneficial side-benefits of regular meditation practice have been widely reported in a variety of secular news magazines and newspapers. These can include stress reduction, strengthening of the body’s immune system, better organized thought processes, improved powers of concentration, enhanced powers of memory, refinement and enlivening of the nervous system, awakening of regenerative energies, slowing of biologic aging processes, development of the capacities of the brain to process perceptions and states of consciousness, and orderly functioning of the body’s organs, glands, and systems. 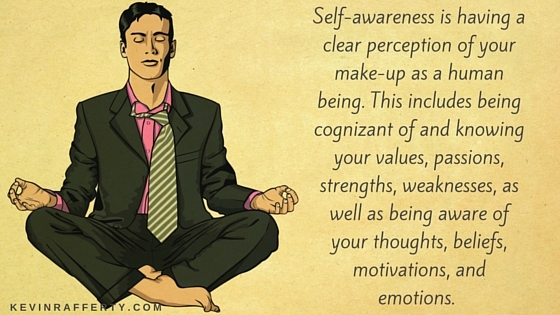 Mindfulness = Presence = Awareness. 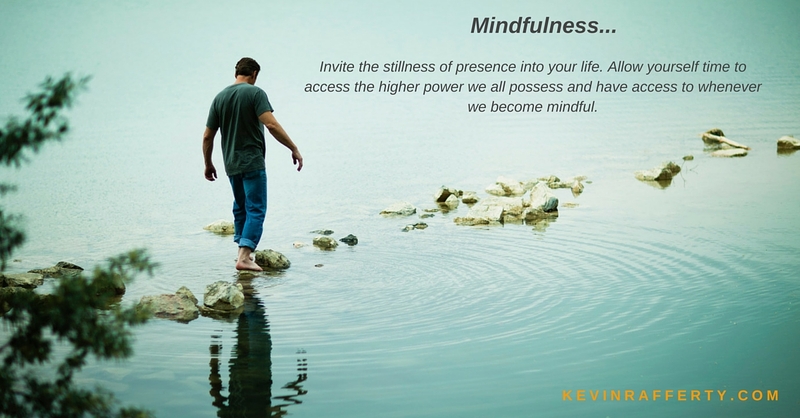 Mindfulness, or being mindful, is being aware of your present moment. You are not judging, reflecting, or thinking. You are simply observing the moment in which you find yourself. Mindfulness involves bringing our awareness back from the past or the future into the present. By residing in the present moment, we can see the inner and outer aspects of reality. While reflecting, we can see that the mind is continually chattering with commentary, judgments, and random thoughts. By noticing that the mind is continually active, we can observe those thoughts, seeing them for what they are without aversion or judgment. Be aware of the voices in your head and the conditioned thought processes that run 24-7-365. The past is past, and the future has not occurred, so all we have is the present moment. 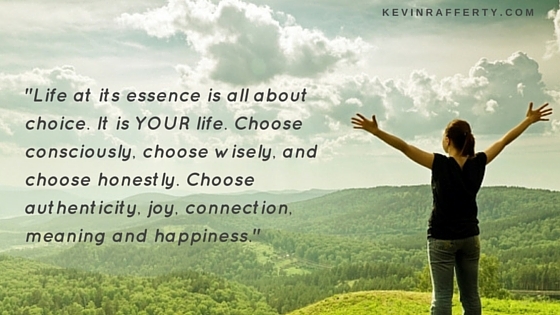 Life is a series of present moments, and in each moment, we can choose to give ourselves the present of presence. When we practice mindfulness, we realize that “thoughts are just thoughts.” We are free to release a thought by letting it go. We realize that the thought may not be based in reality, be an absolute truth, or be one that we agree with. We are free to observe life without being caught in the commentary and mind chatter. We may hear the voices or messages speaking to us within our mind. It is important to be aware that the messages we hear during “thinking” may not be accurate or helpful but may be translations of, or departures from, someone else’s truth. are followed by another and another and another. They come; they disappear. Mindfulness can be done anytime. It does not require sitting or any special process. It is done by bringing the mind to focus on what is happening in the present moment while noticing the mind’s “commentary.” Mindfulness is becoming aware of the sensations in your body, the sounds around you, or the presence of others close by. You can be mindful of your mind’s chatter. Once you notice your thoughts, you can choose to stop identifying with them and their judgments and perceptions. You can choose to think another thought, and if that one does not serve you, choose again. Any activity done mindfully is a form of meditation, and mindfulness is possible all the time. Become the observer of your thoughts and feelings. It is like stepping outside yourself and turning your attention back around to see your thoughts and feelings without reaction or criticism. When you observe yourself having a thought, you are in the present moment. We are not our thoughts. Thoughts by themselves are not good or bad; it’s how we label them. Thoughts can take us away from the here and now. If we are hanging onto past thoughts or worrying about the future, we are a prisoner of our thoughts. Our power will always be in the here and now. We cannot go back and fix a past result, and we cannot leap into the future. When present and mindful, we can choose to look at our past thoughts differently. We may choose to change the way we anticipate the future by changing our thoughts about it now. We have the power, not our thoughts, and the only we can exercise our power is in this present moment. This list is a great beginning to the journey of a lifetime, to you reconnecting with your Authentic Self. We will continue to explore these pathways and others and I welcome your input, experiences and insights. For more information check out Chapters 3, 4 & 11 in my book Wake Up, Get Real, Be Happy – Becoming Your Authentic Self, or email me!